Experience and enjoy nature and culture! The city of Steyr has only recently become a Silent Night location, a circumstance which leads back to a truly coincidental find. In June 2016, a relatively unknown pamphlet with the title “Four New Beautiful Christmas Songs” showed up at a Viennese antique shop. The fourth song listed on the cover page was “Silent Night”. Furthermore, the cover also included the pamphlet’s origin: “Steyr, printed and for sale at Joseph Greis”. This proved that the little booklet came from the typesetter Joseph Greis, who used to run a bookshop at Grünmarkt 7 in Steyr. Joseph Greis published the pamphlet between 1827 and 1832, the exact date is unknown. Since Greis was not only a book printer but also a book salesman, people could acquire the collection of songs from him directly. The printed lyrics include each of the song’s six verses, albeit with a few textual irregularities: Joseph Greis may have acquired a barely readable version of the song or errors may have occurred during typesetting. How exactly he got hold of the song is not known. What is proven, however, is that Steyr was where the song was first printed, multiplied and sold. This is likely the oldest printed version of the world-famous Christmas song. Today, the area around Steyr and the city itself are considered one of Austria’s most important innovation centres, a development which has been taking place over centuries, and which was further demonstrated with the discovery of the oldest textual print from Steyr. For many years now, the city of Steyr and its surrounding municipalities have been developing into a hub for Christmas traditions in the Upper Austrian part of the Alps. 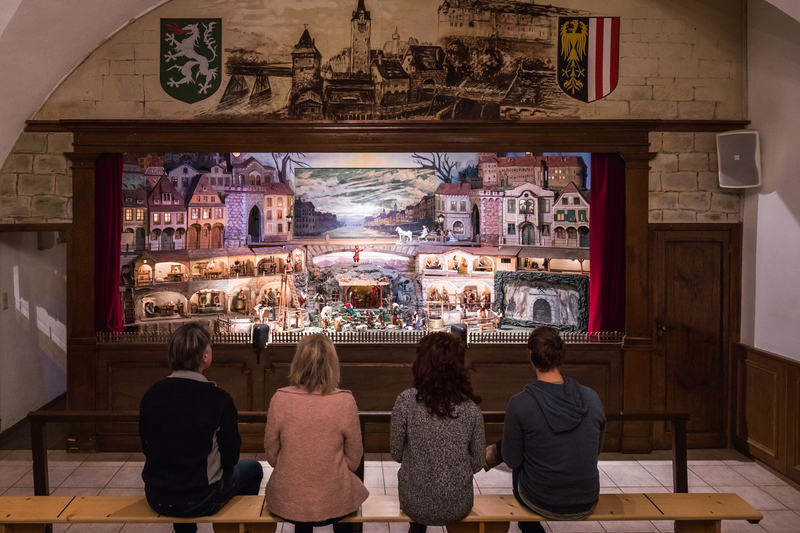 One of these precious showpieces in the Christkindl Region is the Steyrer Kripperl puppet theatre which goes on tour every Christmas. The audience sits with excitement in front of the large theatre consisting of two main stages: Religious scenes are depicted on the lower stage, whereas common Steyr is shown on the upper one. The latter provides space and opportunity for many fun performances from everyday life in the city. Until the end of the 19th century, performances regularly took place at guest houses, whereas today the shows of the Steyrer Kripperl can be viewed at the Innerberger Stadl (Städtisches Museum, Grünmarkt 26) on various dates during the Advent period, around Christmas and on other special occasions. There is plenty to explore in Steyr. A central starting point is of course the large City Square, where one magnificent building is placed by the next. The late-Gothic Bummerlhaus (Stadtplatz 32) is Steyr’s landmark building. An additional architectural masterpiece is the Schmollgruberhaus, which provides an inside-look into the mechanics of old clockworks. Around Christmas time, the nativity scenes start coming into play. 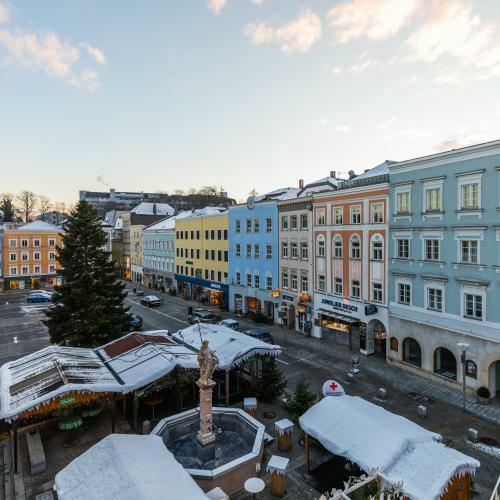 Don’t miss out on the Nativity Tree on the City Square, whereas nativity scenes typical for the region will be displayed in the town hall (Stadtplatz 27). Ideally, you will simply drift, take a stroll through the old town or hike down to the house at Fabrikstraße 10. This is where Joseph Mohr’s grandfather was born. Since November 2018, the first Austrian Christmas Museum in Steyr displays a replica of the first text print of “Silent Night”. Guided tours of the Christmas Museum are possible throughout the year upon prior registration with the Steyr Tourist Board. Among the particularly attractive attractions are the extensive collection of historical Christmas jewellery from the years 1830 to 1930, 200 doll houses, as well as a ride on a train across three floors all the way up to the angel’s workshop on the top floor — a technological marvel on rails. 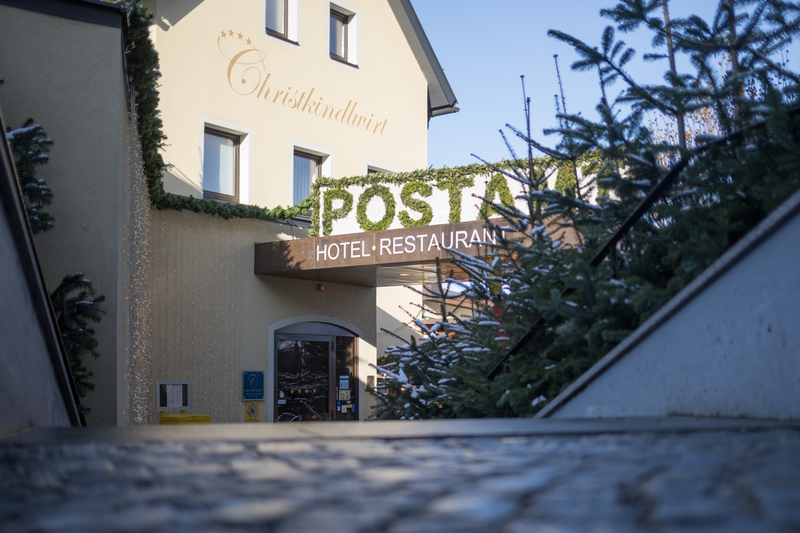 The Christmas Museum is visited by the “Steyrer Christkindl” every Saturday and Sunday during the Advent period. 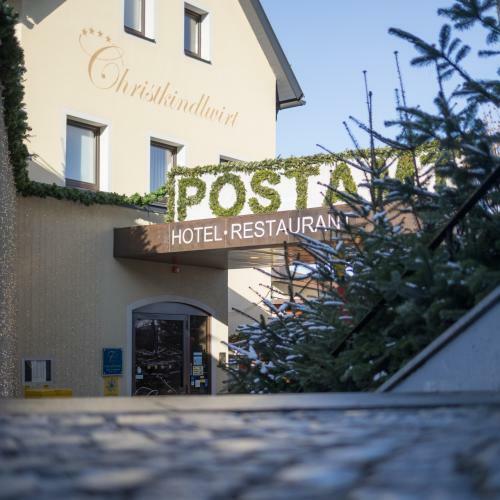 Those who want to embark on a longer hike to the neighbouring towns of Christkindl or Garsten, can follow the marked Christkindl Pilgrimage Trail. The roughly nine-kilometre-long trail almost exclusively consist of asphalt road, highlights are the Christkindl Pilgrimage Church and the Garsten Abbey. The trail is also offered as a guided hike with two prayer sessions (duration approximately 4 to 5 hours). Pay a visit to the Baroque Christkindl Pilgrimage Church in the world-famous pilgrimage destination of Christkindl in Steyr. The church includes a ten-centimetre-tall wax figure of Baby Jesus holding the cross and the crown of thorns in his hand. The parish court also contains two rare nativity scenes. One is a mechanical nativity scene with 300 movable figures, whereas the other one is 54 square metres big and contains over 700 figures. 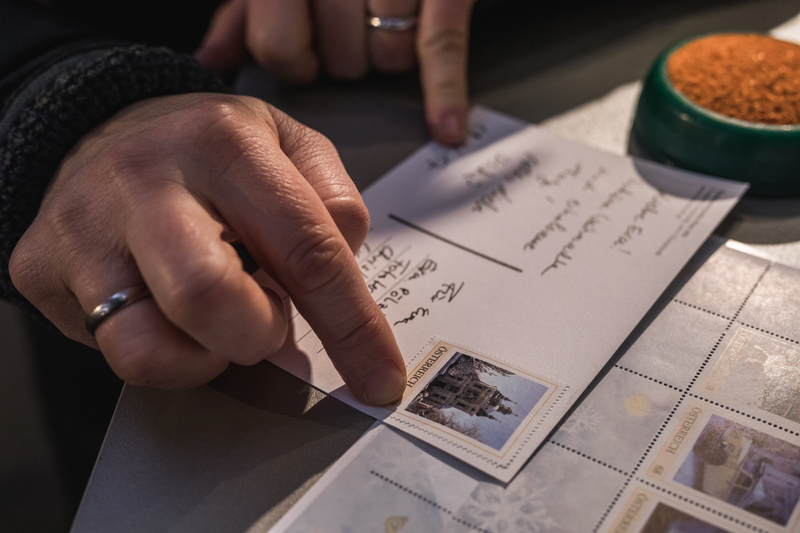 Since 1950, Christkindl has been opening the “Christkindl Post Office” every year during the Advent period. 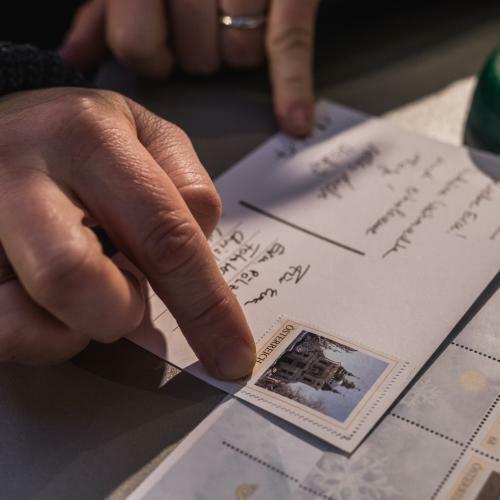 Around two million letters are sent into the world annually here. Every card and every letter is endowed with the much sought-after “Über Christkindl” special postal stamp. During the Advent period, there are countless Advent markets in the Christkindl region, such as in Steyr’s old town, on the promenade, in Garsten, Lamberg Castle or in Steinbach an der Steyr. To get there in the most nostalgic way possible, take the oldest 760 mm narrow-gauge railway in Austria, the Steyrtal Museumsbahn. 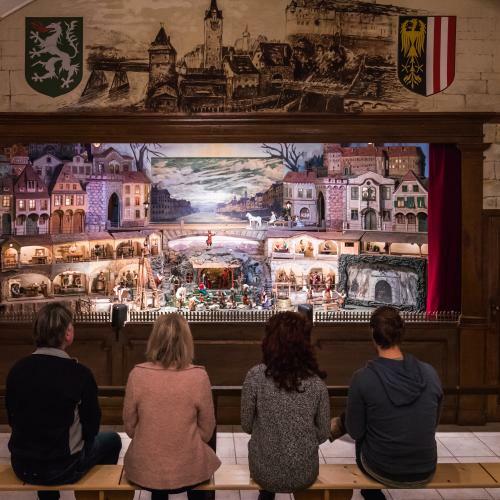 The ride into the Advent calendar town of Steinbach an der Steyr takes around one hour, from 1 to 24 December, one life-sized and beautifully decorated Advent window will be opened at the seven houses at the town’s square every day. a small city with a big heart!